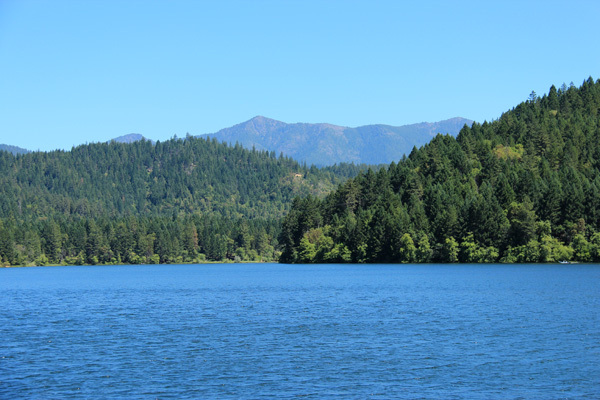 In late June Linda and I and our canines established base camp at Lake Selmac in the SW Oregon Siskiyou Mountains. Linda found several bicycling routes to explore in the area while I hiked several Siskiyou Prominence Peaks. The canines enjoyed the new scents of the area but were glad to leave for the open Ponderosa Pine forests of home by the end of our visit. Before this visit the mountains I planned to visit were just names on a map. By the end of the week they each made an impression on me and I left the area with memories and a better appreciation of the Siskiyou Mountains than I had before. 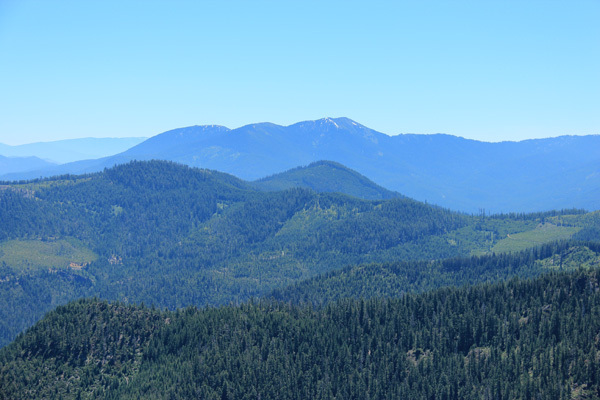 My first goal of the week, on Tuesday June 20, was Grayback Mountain, south of Applegate, Oregon. 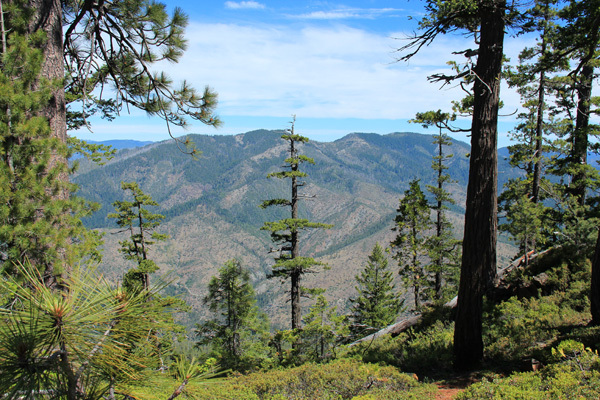 Grayback Mountain is the high point of Josephine County, Oregon with 7048 feet of elevation. 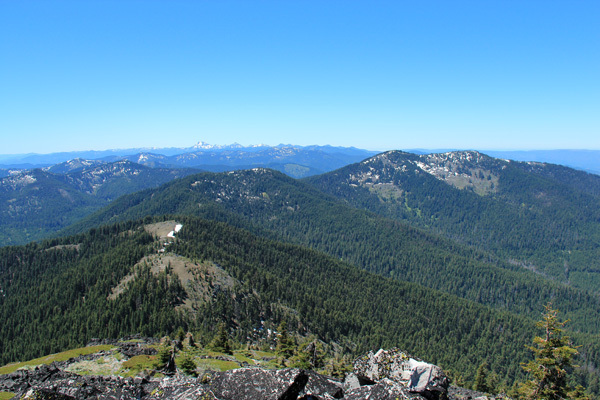 It is also the 49th most prominent peak in Oregon with 2248 feet of prominence. Tuesday morning I drove up the Thompson Creek Road south of Applegate, then took a forest road to the Upper O’Brien Creek Trailhead. The last mile was a bit eroded but the drive in was not a problem for my Jeep. The trail led up the O’Brien Creek drainage. I took right turns at two junctions and headed towards Windy Gap. Before the Gap I left the trail upslope through mostly open forest, meadows, and firm snowbanks to reach the north ridge of Grayback Mountain. It was a warm day but firm snow lingered on the rocky ridgeline and this made travel easier. From the summit of Grayback Mountain I had very nice views south towards the California Siskiyou Mountains. Many rocky and snowy peaks rose from the ridges but I did not know any of them. I did recognize Mount Shasta rising to the southeast and Mount McLoughlin to the east. The Lake Selmac area was to my northwest and I tried to determine which of the peaks circling the Illinois Valley were my goals for the remainder of the week. Grayback Mountain seemed to tower above them all. 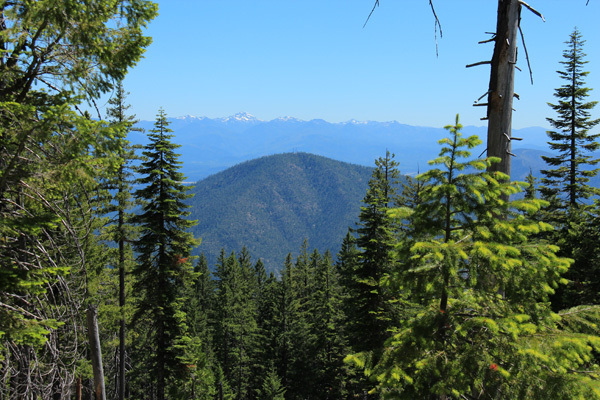 On Wednesday June 21 I hiked two Oregon prominence peaks rising above Selma, Oregon. 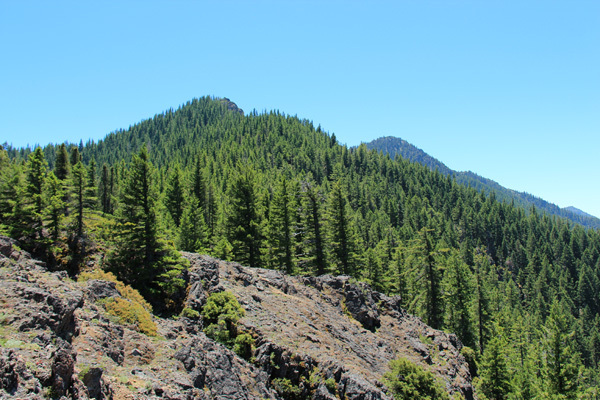 Eight Dollar Mountain is the 33rd most prominent peak in Oregon with 2520 feet of prominence but only about 4000 feet of elevation. I followed a gated road to the communication towers and support buildings on the summit and viewed Squaw Mountain between trees to the north. Reaching the summit of Squaw Mountain involved driving a steep forest road followed by a very short but scenic walk through meadows to the summit of Squaw Mountain, the 64th most prominent peak in Oregon with 2080 feet of prominence and about 4680 feet of elevation. It was interesting how the higher peak had less prominence than the lower peak, but this is due to the nature of local topography. 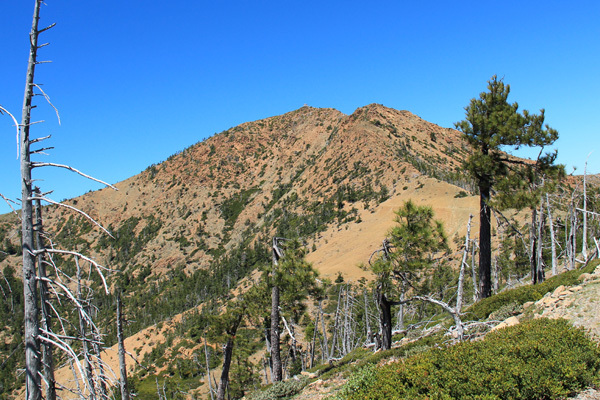 On Thursday June 22 I hiked Pearsoll Peak in the Siskiyou Mountains west of Selma, Oregon. Pearsoll Peak is the 28th most prominent peak in Oregon with 2600 feet of prominence and 5080 feet of elevation. I expected a long day and I got it, with about 14 miles of hiking and 4000 feet of cumulative elevation gain. 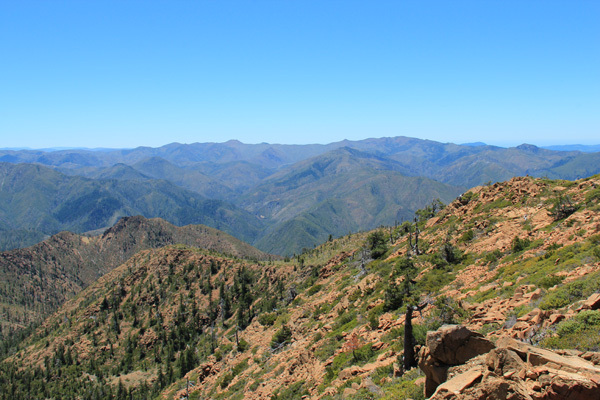 I decided to hike the peak from the Kalmiopsis Rim Trailhead because I anticipated excellent views along the Rim and hoped for a breeze to mitigate the expected hot weather. 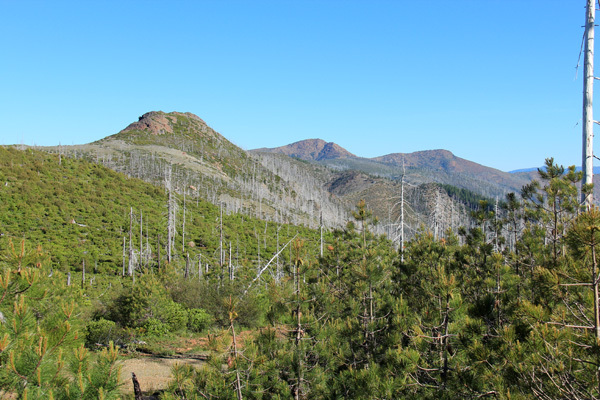 The route was very open due to the 2002 Biscuit Fire that burned 500,000 acres along the route and below me in the Kalmiopsis Wilderness, so I got the views though mostly of burned forest beneath me. The breeze was brisk and I took care not to loose my sun hat but I certainly missed the breeze when I did not have it. Subsequent brush has started encroaching onto the trail and hopefully the trail will get some maintenance in future years. I found some patches of shiny dark green serpentine along the trail, which suggests at least some of the rim was once deep sea floor and has been subsequently raised. The earth is so ancient for such geological processes to have occurred! Looking west from Pearsoll Peak. 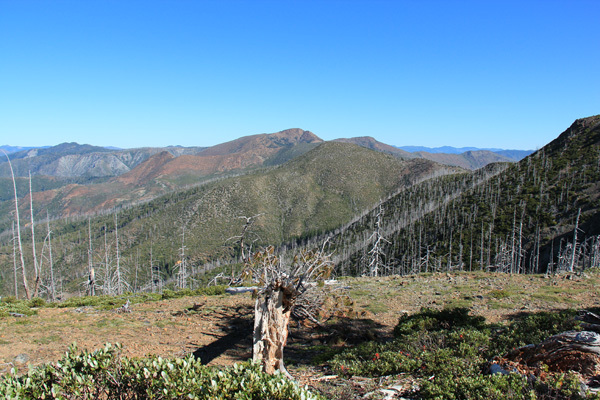 The heavily burned Kalmiopsis Wilderness lies below. The summit had very open views in all directions. I easily picked out the other peaks I had visited or planned to visit last week. I found the PEARSOLL benchmark near what appeared to be the summit, but I did not find a summit registry. On the return towards the trailhead I walked about 100 yards to the west of the trail to tag the summit of Eagle Mountain. I thought I deserved that after all the up and down hiking I did along the Kalmiopsis Rim. 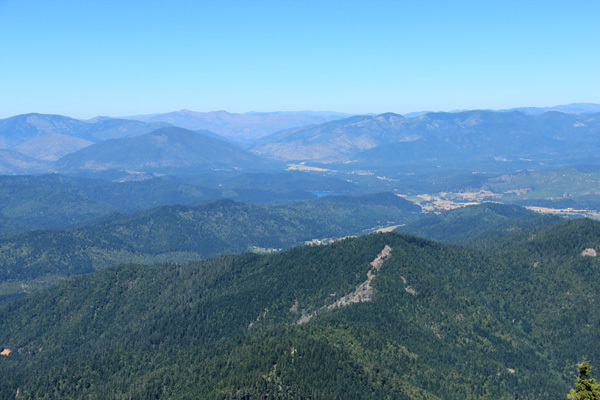 On Friday June 23 I hiked Kerby Peak in the Siskiyou Mountains east of Selma, Oregon. 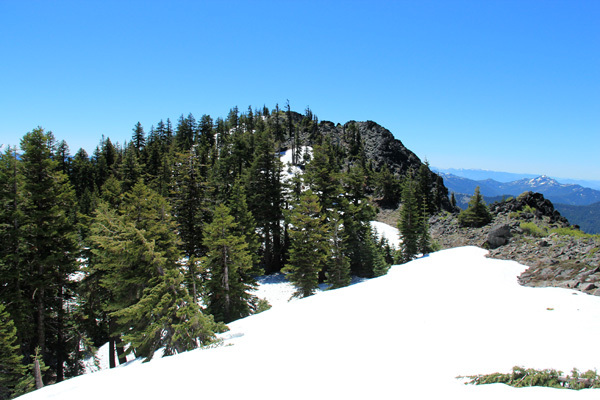 Kerby Peak is the 90th most prominent peak in Oregon with 1872 feet of prominence and 5545 feet of elevation. This was my last peak to summit during this visit to the area. It was a fun and scenic way to finish the week. I found the Kerby Peak Trailhead and started up the steep trail in morning shade. 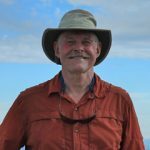 The day quickly warmed up but as I climbed to the ridgeline I experienced a gentle breeze that mitigated the warmth and the trail was in excellent shape. I was forewarned to expect to see Brewers Spruce on the hike, a vulnerable species with a very limited range restricted to SW Oregon and NW California at higher altitudes. 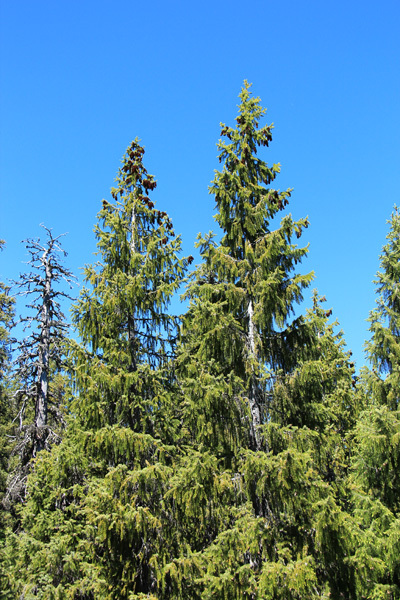 For most of the climb I saw mostly Douglas Fir but as I neared the summit I suddenly noticed level branches and curtain-like hanging branchlets containing spruce-like needles. So this was Brewers Spruce! Looking around I saw several other trees and stopped for photos. The trail switchbacked around rocks as it climbed to a broad summit. The summit view was very open. I recognized all the peaks I had climbed that week and could clearly see Lake Selmac below. After a lunch and taking many photos I descended the trail with a sense of victory. It had been a fun and successful week of exploring the Southern Oregon Siskiyous. This entry was posted in Family, Hiking and tagged Brewers Spruce, Eight Dollar Mountain, Grayback Mountain, Kerby Peak, Oregon, Pearsoll Peak, Siskiyou Mountains, Squaw Mountain. Bookmark the permalink.